CRIMEA, Ukraine -- For the photographer who captured this amazing image of a kingfisher, it must have seemed too good to be true. What are the chances? 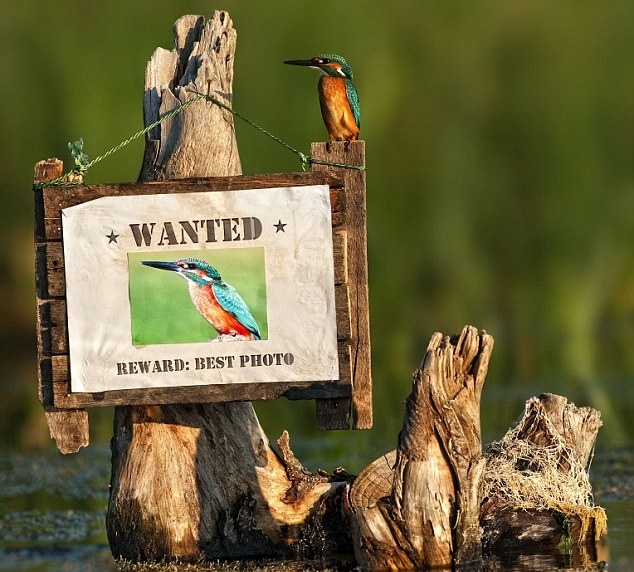 A kingfisher seemingly couldn't resist striking a pose on top of a sign carrying its picture. The brightly-coloured bird perched on top of its own 'Wanted' poster - mimicking the exact pose as its doppelgänger. Some might say it was fortuitous timing that the bird landed on the sign when he did. Cynics, however, could argue the kingfisher was already a regular visitor to the beauty spot meaning it would have only been a matter of time before he stopped by for a look. The kingfisher put on his show at an artificial water-pond called Chikurelli, near Lekarstvennoe village, Crimea, in Ukraine.